A Tent With No Walls! I have been writing on, and writing blogs now for nearly ten years, and in that time I have been called pretty much every name you can think of to describe political affiliation and ideology. When I started out, I was labeled a radical right-wing nut job. In fact my first screen name over on the old WGMD bulletin board site was RWR, which stood for “Right Wing Radical”(It just so happened to be the initials of Ronald Wilson Reagan). Oh! Your back, I didn’t hear you coming, let me turn down the music. So, I wrote that three years ago, and one might say that I nailed it in regards to the direction that the GOP has taken in that time. In that time on the national scene we saw the TEA movement peak and begin to fade. The so-called hard right has little national influence beyond the fact that the main stream media loves to hold it up as the face and the voice of the Republican Party in order to discredit the party as a whole. In my opinion the TEA movement, or the radical right will continue to shrink, not because its original principles were wrong, but because it has moved too far to the right, and actually away from those principles. Remember? If you continue to move to the right, you end up on the left. However, here in my home county of Sussex County Delaware, the radical fringe right has embedded itself in the county GOP Executive Committee. They have been successful in either running out the actual conservatives from the committee, or else their bullying tactics have silenced those who remain. Back in 2008 or so, I was calling on the more moderate, and yes, left leaning members of the Delaware GOP to make room in the GOP tent for the more conservative members. I, like many others wanted only to have a voice within the party, a more balanced party. 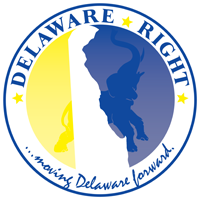 In my opinion the Delaware Republican party had drifted too far to the left, off of that center line of conservatism I mention in the other post. In doing so, the GOP was missing out on bringing more people into the party, we actually saw a wave of people leaving the GOP to become unaffiliated, or maybe even Democrats. OOPS! Sorry, I thought I had time enough to eat a little something, but no worries, let us continue. The problem is, today that committee is controlled by a group of people who are not interested in growing the GOP. They are only interested in boiling it down to their ideal of purity. They have gone so far right that they have not only found themselves coming back on the left, they have found themselves starting back around again to the right. This ideal of conservative purity does not make a better party, it makes only a smaller party. But they are not limited only to questions of political purity, they also demand religious purity, they lock their politics to their faith, and if you differ from either, then they make you feel unwanted. notice how the “T” in district is transformed into a cross. What message does this send? Well it sends the message that this is a Christian organization, all others need not apply. Of course those who choose to wear this would never admit this, and could never understand that people would even think such a thing. It is this intolerance, and lack of understanding that has caused another wave of people exiting the GOP. Not because of the party’s drift to the left away from the center of conservatism. But because of the mad dash to the far, extreme, fringe right, a place where those who dare to disagree are bullied, threatened, and made to feel unwelcome. I once called on people of a more conservative view-point to join the GOP to balance out the left leaning “establishment”. I now call on people of a more moderate view-point to come back to the GOP, to stand up, to not just balance out the weight of the far right fringe, but to help pull the Republican Party of Delaware in general, and Sussex in particular, back from the cliff that the party is headed towards, a cliff, that if the party is allowed to continue over, will mean oblivion for the GOP in Delaware. We need hard-working people with jobs, and businesses, and children, people who care about more than their lawns. People who read and listen to things outside of the TEA echo chamber. We need Christians, and Jews, and yes Muslims and atheist if they share the core values of the party. We need White, Black, Asian, men, women, old and young. We must grow the party, not boil it down to some self-serving ideal of purity. The same as back in 2008, when I was calling for the party to open its collective arms to embrace the more conservative views, I am now calling for the party to open its collective arm to embrace a wider view of conservatism. Of course this group that demands purity will not choose to allow this to happen freely, it will require good people, rational people, to be willing to stand up to the bullies, to suffer the shouts and name calling, to be willing to be called liberal and RINO and any other name these people can think of in an attempt to scare away good people, so that they can feel important within their ever shrinking sphere of influence. It will not be easy, it will be ugly and base at times, but people need to know that there are more of the rational people than they think, the problem is, rational people don’t shout and call names, and so it is understandable that many think it is the fringe that has the larger numbers. Not so. If the GOP in Sussex and Delaware are to grow and move Delaware Forward, then what we really need is a tent with no walls. 26 Comments on "A Tent With No Walls!" So I get up this morning, early and with hungry dogs and cats, and sit down to read this post. Mostly I agree, seems a smooth read. Then I get to that logo for the 20th district, a pic that I used in my own recent post on this site on my Picture Worth a Thousand Words post, and I thought it was cool. Well I mostly thought it was cool because, honestly, the notion of an RD icon amused me and prompted me to ponder that such things might bring a cohesiveness of a disparate group of ED’s, a sense of team spirit if you will. But I did not notice that cross thing and indeed, it can’t be mistaken as anything but a cross. And wow…..while it doesn’t offend me, it does bring me to agree with Frank on this point. I don’t think that’s such a good idea. Why on earth put that in the icon? 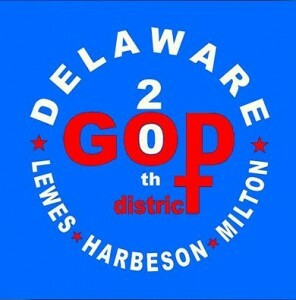 The 20th district is not known world wide as a Christian bastion; the 20th RD is a Representative District in Delaware and this logo is a representation of the Republican party working that district. Anyway, I’m done. Not sure about all of Frank’s prose about right, left and in the middle but I got to agree….putting an obvious cross on that thing was a bit dumb and it’s totally unnecessary. BTW, I live in the 20th district and I vote to alter the image to remove that cross. Also my profile pic has been changed on Facebook as the one showing here is almost ten years old. How can I get it changed on this site? Trying to be honest here. It is about how we view things and perception. I think you missed the mark Frank. I did not interpret that as a cross. I saw it as a slap in the face to the rest of the committee. That is the symbol for women. Ala the new RD being a women and trying to include women in the logo and grow her tents population against angry old white guys telling women what they can and can not do with their bodies. Maybe you should call her and ask before you imply what she meant, I would like to know the answer. WP, sorry to break this to you, that logo was designed prior to the election of the new RD. It was designed by Larry Mayo an ED in the 20th. And trust me, it is a cross. And to be honest, not sure it is an official logo for the 20th, but just a small groups way of staking out there territory. The new RD Cathy Watts had nothing to do with it. This is what I mean when I say that these small fringe groups are being seen as the face and voice of the party, but in my view do not represent the larger makeup of the GOP. Frank, thank you for the clarity, however….. If I were Ms. Watts I would embrace that logo and play the women card. The fact that Mr. Mayo may have latent feelings for women that do not align with his purity oath, I find even more entertaining than my original explanation. The only thing that should be embraced from Mayo is his resignation! I think you’re right, Frank….it was designed by Larry Mayo. In fact I saw him wearing a shirt with the logo on it, forget when. and no, I don’t see it as a symbol for woman but if it were it too would be inappropriate. It ain’t rocket science….th 20th district is a Delaware representative district, not the new Jerusalem or haven for ignored females. It’s for EVERYONE who lives there! Now if Larry Mayo wanted to form some sort of Christian coalition composed of Christian Republican residents of the 20th district the icon should be changed to indicate that and it would be perfectly fine. I love Larry Mayo and the guy works as hard as anybody in the GOP. Where you’re off base Frank is that decent leadership would bring all the groups together and have each working on their own area of expertise. It’s my story and I’m sticking to it. I will leave such transformation to Frank Knotts. …..what the Chair of the Sussex GOP should do, well note that subtle cross symbol and point out, as I have, that the 20th RD is not just about Christians. 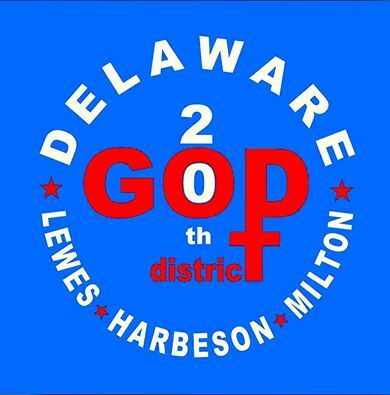 Then said Sussex GOP Chair would ask that the symbol be removed BUT encourage such icons for RD’s….iindeed maybe hold a contest, have all the RD’s design their own icons. I like how the towns are named, the cleverness of inserting the district number in the title. Such a thing would be great publicity method, get the folks in Lewes….etc….or whatever RD….to know their number becaue right there it’s on their Tshirts! It’s a good idea is what I’m saying here. We need a Sussex GOP chair to better guide these people to what they do best. You want me to run for Sussex Chair? Cause I’d have this troubling matter turned into a plus toot de sweet. But, alas, I am running against Joan Deaver, see my next Delaware tidbits post, and cannot do everything. This time I am really done. By the way I did submit the logo to both the county and state GOP prior to having the shirts made in October. … to help pull the Republican Party of Delaware in general, and Sussex in particular, back from the cliff that the party is headed towards, a cliff, that if the party is allowed to continue over, will mean oblivion for the GOP in Delaware. Yes, that’s what we need in Sussex. More “moderate” Republicans, indistinguishable from Democrats. And shortly thereafter, we’ll have real Democrats, just like SOSNCC. While we’re at it, let’s make sure that we run another “moderate” Republican for president, so we can lose again. No where did I say it offends me, as you always do, you have again attempted to create what does not exist. What I said was, your cute little attempt at a logo sends the message that the 20th District is a Christian organization, and that all others are unwelcome. Don’t bother denying it. I am also always struck how the only way you have to make a point is to quote others, have you no thoughts of your own? Patrick Henry was correct, in that the nation was founded primarily “BY”, Christians. However, your childish T-shirt seems to say you believe that it was founded “FOR” Christians. You are the poster child for those who wrap their politics in their faith in order to deflect criticism, for how can I criticize your politics without criticizing your faith? It is a cowardly thing to do. So tell me Larry, where in any of our founding documents is Christ mentioned? Not private correspondence between the Founding fathers, but in the actual documents. In fact Larry, as I am sure you know, being a teacher of all things having to do with the founding of this nation, God is mentioned once in the Declaration of Independence, and as the Creator once, and the Supreme Judge of the World once. But no where is Christ mentioned. Now while the D O I is the Founding document of the USA, it is not the governing document, that would be the Constitution, and Larry, would you like to tell everyone how many times Christ, or even God is mentioned in the Constitution? No? Okay I will then, that would be not at all. Why do you think that is Larry? Because while the Founders and the framers were primarily Christian, they were also realist, they understood that not everyone was a Christian, and that to best protect their freedom of religion, they must first protect that of those who disagreed with them. So right here right now Larry, tell us. Are you saying that the intention was not to create the image of a cross in your logo? Someone asked me a question not too long ago, “what is the difference between God and Larry Mayo? Answer: God doesn’t pretend to be Larry Mayo”. Now if Larry Mayo can offer up a proper attribution to the quote, that would certainly settle matters. Over to you, Larry. Rick, I know that you have been here through the times when the left leaning faction of the GOP was in control, and that like myself you opposed it, because there was no real balance. Well that is what is happening again, except this time it is the far right attempting to keep out those who do not agree 100% with them. The same as one party rule is detrimental to the state, a party that is ruled by the fringe is detrimental to the party. The way this works is that there are degrees of conservatism. The purist form in my opinion is in the middle of conservatism where it is applied equally to all issues. Then you have the left leaning faction of conservatism, usually this is based on a more liberal attitude on social issues. Then you have the far right of conservatism, again this is mostly based on social issues. The common ground should be on fiscal issues, but all too often that is lost because the social issues are so emotionally charged that people refuse to work with those they disagree with on issues like abortion and gay marriage. As long as either faction continues to seek purity for their personal agenda, the party will founder. In a state where the political landscape runs the gambit from ultra liberal to ultra conservative, to be able to win state wide, the party must be perceived as being willing to represent all views, based on core values. I happen to believe that when applied without bias, conservative values and principles have a broad appeal, to even those who may self identify as progressive. Honi, you start holding your breath, and I’ll start counting. The best we are likely to get is some quote from Larry’s IOTC text books. Larry, the Patrick Henry quote would be great support for your position except that Patrick Henry never said it or wrote it.It was written in the 1950’s in an issue of “The Virginian”. Historians can not find the quote, or any mention of the quote, prior to April of 1956. JS, we are wasting our time with Larry, when he is cornered by facts he simply turns to smoke. He is most likely over on his Facebook page, from which I am blocked, saying that I am the Devil’s advocate. It’s interesting as I read all these comments and posts from past few weeks and some people seem to blame Frank for problems in Sussex GOP and attack Frank as the evil doer in the area. I’m not saying I always agree with Frank and can say that there are posts he has written in the past that I think are in poor taste, but the recent posts revealing the actions and behaviors of some leaders of the Sussex GOP is pretty eye opening and it’s important to point it out. One more thing I’d like to comment about what Larry wrote. I would say you can have fun and design creative shirts and wear them all you like because it’s one of the benefits of the freedom in our county. But don’t disrespect the newly elected leaders of the 20th district RD and ED’s by demanding this represent their district without their vote or say. Think about it. You can’t use the “people last year said it was OK” excuse. Not at all OK man. This is why we have elections so new ideas and voices can be heard. Not “so and so did this last year or 10 years ago so the decision still stands” remark. Also I did not interpret the post saying you have to sacrifice your own beliefs by leaving religious or gender bias symbols off of political items. So go ahead and wear your shirt and maybe a Jewish Republican in the 20th can wear a GOP shirt with a Jewish symbol on it. I don’t care and love it that we are in a free country where both of you can do that. But NEITHER of you should claim this is the official logo that represents ALL of 20th Republicans. So Come on man! Don’t be so disrespectful of these newly elected leaders and of the Republicans in the 20th that do not believe exactly what you believe. My wife wants me to add that she especially does not like you speaking as if you are the elected chair of the 20th district when it was revealed in the comments that that this individual is a woman. Not cool man. Women can speak for themselves. As the Chair of the 20th RD, I would like to clear up the issue of the logo. There is no 20th District logo. Larry can wear his shirt because this is America. It is time to move on. As shown on this thread, Larry Mayo’s logo has resulted in some confusion about whether the 20th District is its sponsor. Cathy Watts seems unconcerned about its use. Hey Cathy, I have a Louis Vuiton bag I’ll sell you for a song. Interested? Seems to me she WAS concerned that people believed, due to Larry’s comments, that this was the official logo of the 20th. Therefore she posted to ensure everyone was clear that it is NOT the logo for the 20th. In fact there is NO logo for the 20th. Can you not read her statement? Too direct and clear for you to understand? Is it because you want her to be obnoxious like some people who post comments and start name calling? Grow up. Your comment does not even make sense. If you want your leaders in the community to act like jerks, yell at people and name call then you are also a part of the problem. Cathy can’t control what Larry wears or anyone else wears. Do you want her to act like his mother and scold him for wearing the shirt? So ridiculous. It’s obvious you trying to bait her to get into some childish back and forth game. She cleared up the issue, you are the only one confused at this point. Jack, I don’t know “honi soit” but I did notice that the person that posted the message that you commented on is “hoit soit”. They very well may be the same person but it looks like someone is trying to “stir the pot”. Other than the level of violence, is there really much difference between the underlying ideology of political Muslims and political Christians? Sorry Cathy Watts you’re just as wrong as Larry Mayo. Unless the 20th District votes in that logo, it should not be used. If Larry Mayo wants to change the logo to say “20th District Right Wing Fringe Christians Who Work Against the GOP Primary Winner” that would be one thing, but the shirt implies that the logo has the support of the entire 20th District, which is BS. If Mayo actually cared about the GOP and not his specific version of what he thinks the GOP should be he wouldn’t have produced the shirts without the 20th district’s approval. It doesn’t matter if Mayo lives in the district, he doesn’t speak for the district. This is just more bullying BS from the same old crowd that will eventually make the SCGOP into the NCCGOP. Larry, look in the mirror, Frank isn’t the problem you are. Hypocrazy watch, please read Cathy’s comment for what it says. There is no logo. Larry’s shirt, he was claiming to be an official logo, is NOT the logo and there is NO LOGO. Larry wearing his made-up shirt means NOTHING. He tried to make it important and official but Cathy shut that down. It was pretty obvious in her statement. Hypocrazy watch you are giving Larry way too much credit with his shirt. Please stop giving him power that he DOES NOT HAVE. Because of our wonderful country and it’s freedom Larry can wear his shirt and create a matching hat and shoes to go with it. WHO CARES!! It does not represent the 20th district. It represents LARRY. Except for one small (and by that I mean huge) point, Jack, which is that no one beyond readers of this blog would ever know that was not the official logo. So when Larry sports that around town, the average 20th District resident would have no idea that the shirt isn’t official. If that stupid shirt loses the GOP 1 vote, that’s 1 vote too many.